Party hosts on the West Coast. Taking to the pop-up gallery space, the 'LA Galerie', Paris Saint-Germain launched their 16/17 Nike away kit last night. A launch that was surrounded with creative style, players dropped into the 'LA Galerie' space to pick up custom one-offs of this lightning bolt of rouged beauty. LA's finest kings of the custom game, Chain Gang LA were also on hand to weave some bespoke threads into the players editions of the shirts. The 16/17 away kit front and center, it's a stage setter that catches the eye at every turn. 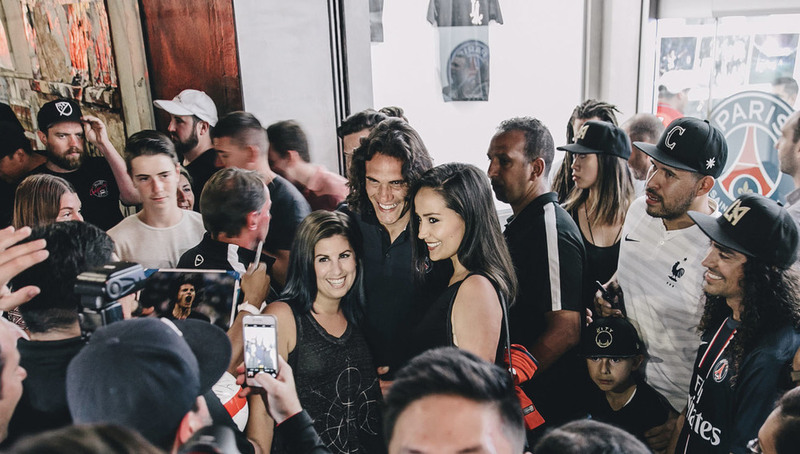 The blend of on and off the pitch culture never looking so strong, the likes of Edinson Cavani and Thiago Silva were both on hand to kick back with fans as the day turned into night. This Parisian take on LA life an inspired fresh take on proceedings, is definitely one to savour and will have no doubt won over many fresh fans to the PSG way of thinking. The Predator Prestige Is Back! adidas ACE Tango 17.1 "Ocean Storm"
It's All About Neymar Isn't It? adidas ACE 17+ Purecontrol "Ocean Storm"
adidas X 17+ Purespeed "Ocean Storm"
adidas Nemeziz 17+ 360 Agility "Ocean Storm"
evoPOWER Vigor 1 Is Here!